See Thornhill Square (q.v.) for history of the estate and family. The site was originally the garden of the Vicarage of St Andrew's Church at 7 Huntingdon Street, where George Thornhill, the developer of the Thornhill estate, had lived. The OS map of 1874 shows the garden with paths, lawns, trees and shrubs. The Vicarage became a private school and then flats, and from the early C20th the garden was abandoned and became woodland. There were attempts to develop the site and LB Islington purchased it in 1974, originally planning to build on it but the awkward site was difficult to access and this led to the decision to leave it as open space. Nos. 1 and 2 Crescent Street, also owned by the Council, were demolished to create access. In 1977 a group of local residents had tried to secure the Council's commitment to retaining it as public open space but in 1981 there were again plans to build over the site. 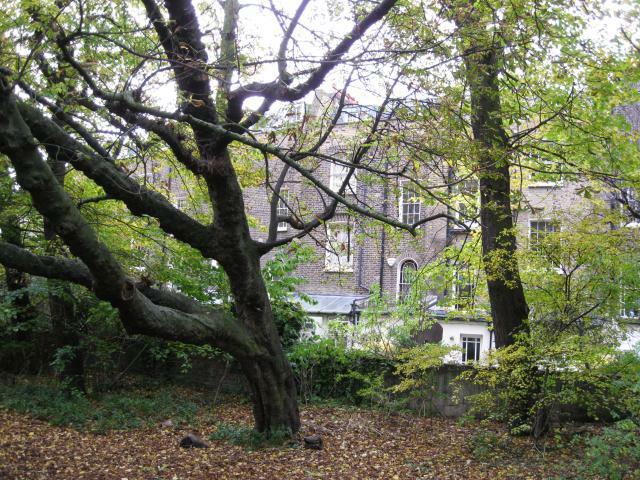 A residents group formed themselves as Barnsbury Wood Co-operative and proposed to buy and manage the wood as an ecology park. In 1996 it gained Local Nature Reserve status, the smallest such site in London. Barnsbury Wood has mature secondary woodland and is important as the largest area of woodland in the borough. Trees include sycamore and ash, with lime and horse chestnut around the edges and woodland shrubs. There has been new tree and shrub planting since 1985, when children from local schools planted 200 saplings, and 2000 bluebell bulbs were planted in 1991. At the entrance, in the gap where houses once were, a garden has been planted with shrubs including lilac, hebe, lavender, roses, euphorbia and hydrangea, with railings to the street.